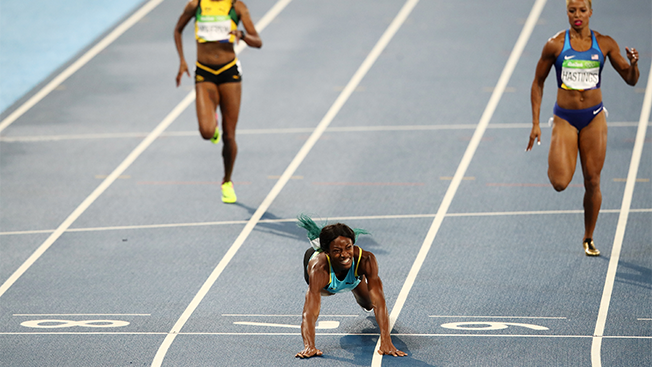 NBC's Monday night Olympics coverage was highlighted by Shaunae Miller's 400-meter gold medal victory. The win was a controversial one, with Miller making a desperate lunge at the finish line to edge American sprinter Allyson Felix, who was seeking to become the first woman to win five Olympic gold medals in track and field. The U.S. women's gymnastics team delivered more impressive performances Monday, though no one scored a gold. Laurie Hernandez, the youngest member of the team, bested Simone Biles to win the silver medal on balance beam. Biles held on for the bronze, her fourth medal of the Rio Games. Ratings for Monday night's coverage were significantly down from the previous Monday, a night which featured six U.S. swimming medals, including one of many dominant performances by Michael Phelps. NBC had 24.3 million prime-time viewers. The Total Audience Delivery metric boosts the prime-time average by 5 percent to 25.5 million. That's still a 19 percent decline from the previous week. The network delivered a 14.9 household rating, down 18 percent from last Monday. While broadcast ratings are down, NBC Olympics digital platforms had their best day ever for the third consecutive day, with 13.4 million unique users on Monday (up 45 percent from 2012). NBC Olympics' livestreaming for Rio 2016 has reached 2 billion minutes for the first time in history. That total is over 500 million more minutes than the combined total of all prior Olympics. Top local markets for NBC Olympics Monday night were led once again by Salt Lake City (23.5). Following were Denver (22.7), Kansas City (22.1), Minnesota (21.7) and Richmond, Va. (20.8).